(Newser) – There's a new plagiarism kerfuffle making the rounds in political circles, but this one is a little strange. It begins with this tweet from Donald Trump Jr.: "I'm honored that POTUS would plagiarize a line from my speech last week. Where's the outrage?" He was referring to President Obama's speech at the convention, in which Obama says at one point, "That is not the America I know." 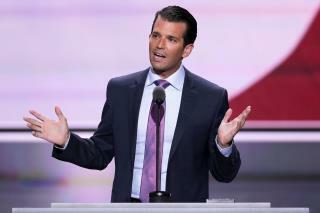 In his own speech earlier, Trump Jr. had said, "That's not the America I know." NBC News does a thorough rehashing of the phrase, finding that Obama has used it previously in speeches as president, as did George W. Bush. The Washington Post notes that both Bushes actually used it, as did Walter Cronkite, and on and on. Is there anything in life that hasn't been said before. This whole issue is beyond ridiculous. Quotes from the 2008 presidential debates and the 2016 DNC convention can be located in the 2007 novel 'George's Flag - a novel of political intrigue'. The quotes used are common today and probably do not constitute plagiarism. In the 2007 novel, a fledgling political party hacks the computers of the DNC and RNC to access e-mails, donor lists and accounting records. Two weeks before the November 6, 2040 presidential election, a foreign entity releases a computer virus named Armageddon to protect the fledgling American political party. Greedy, corrupt, criminal, hypocritical, dishonest, lazy, dirty, murderous, nanny, trashy, etc. This IS the America I know.